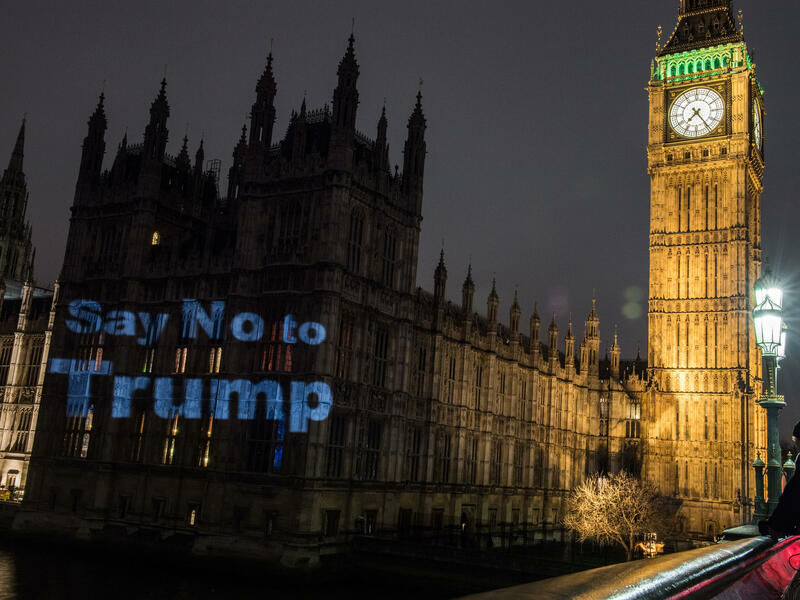 A message of "Say no to Trump" is projected on Britain's Houses of Parliament the evening before a Monday parliamentary debate took place on Donald Trump's state visit. Nearly 2 million people signed a petition in support of scrapping or downgrading the invitation. As thousands protested outside the U.K. Parliament on Monday, members inside debated whether President Trump should receive the honor of meeting the queen on a state visit later this year. State visits by U.S. presidents are rare in Britain; Labour Party lawmaker Paul Flynn noted that only two — Barack Obama and George W. Bush — have made them. The parliamentary debate was triggered by a petition opposing the state visit, signed by more than 1.8 million people. Another petition supporting a state visit garnered just over 300,000 signatures. The debate will not change the outcome. The U.K. government is committed to a visit, citing the so-called "special relationship" between the two countries. It is offering a state visit in large part because it needs a free trade deal with the U.S., as Britain prepares to leave the world's largest collective market, the European Union. Some members of Parliament noted that the queen has hosted controversial leaders in the past, including Zaire's dictator Mobutu Sese Seko in 1973, and Chinese President Jiang Zemin, who visited Buckingham Palace a decade after the 1989 Tiananmen Square crackdown. But the discussion provided insight into how Trump is viewed by one of America's closest allies. Arguments for and against were largely drawn along party lines, but those speaking in favor of a state visit were keen to point out that the invitation was extended to the office of the U.S. president — which Trump happens to occupy. The day after the inauguration, 2 million people, mostly women, marched on the streets of America and 100,000 people marched in this country. It was an expression of fear and anxiety that we had [of] someone like this in the White House wielding such enormous power. ... but unfortunately his intellectual capacity is protozoan. We might not like some of the things [Trump] says. I certainly do not like some of what he has said in the past, but I respect the fact that he is now delivering the platform on which he stood. He will go down in history as the only politician roundly condemned for delivering on his promises. It is difficult to know whether to be appalled at the morality of the invitation or just astonished by its stupidity ... To put ourselves in a weak negotiating position and then advertise it so blatantly to President Trump, as the Prime Minister managed to do, is a recipe for total and utter disaster. Carmichael: "Having offered a state visit this time, what will we offer the next time we want to get a favorable response?" Carol Monaghan, a member of the Scottish National Party, said when Trump was elected, she tweeted: "Xenophobic, racist, sectarian and sexist rhetoric has just been legitimized. We should all be very afraid." Monaghan, who represents Glasgow, Scotland, said some Trump supporters responded with critical tweets of their own. She read a few aloud in Westminster Hall, noting her personal favorite came from a "geographically challenged" man in Dallas: "Ignorant, thick, foolish is the order of the day with Carol Monaghan. Australia should be very afraid."